Your teacher will give you some figures or objects. Sort them into polyhedra and non-polyhedra. What features helped you distinguish the polyhedra from the other figures? Here are some polyhedra called prisms. Here are some polyhedra called pyramids. Look at the prisms. What are their characteristics or features? Look at the pyramids. What are their characteristics or features? Which of the following nets can be folded into Pyramid P? Select all that apply. Your teacher will give your group a set of polygons and assign a polyhedron. Decide which polygons are needed to compose your assigned polyhedron. List the polygons and how many of each are needed. Arrange the cut-outs into a net that, if taped and folded, can be assembled into the polyhedron. Sketch the net. If possible, find more than one way to arrange the polygons (show a different net for the same polyhedron). What is the smallest number of faces a polyhedron can possibly have? Explain how you know. Your teacher will give you the net of a polyhedron. Cut out the net, and fold it along the edges to assemble a polyhedron. Tape or glue the flaps so that there are no unjoined edges. How many vertices, edges, and faces are in your polyhedron? A polyhedron is a three-dimensional figure composed of faces. Each face is a filled-in polygon and meets only one other face along a complete edge. The ends of the edges meet at points that are called vertices. A polyhedron always encloses a three-dimensional region. A prism is a type of polyhedron with two identical faces that are parallel to each other and that are called bases. 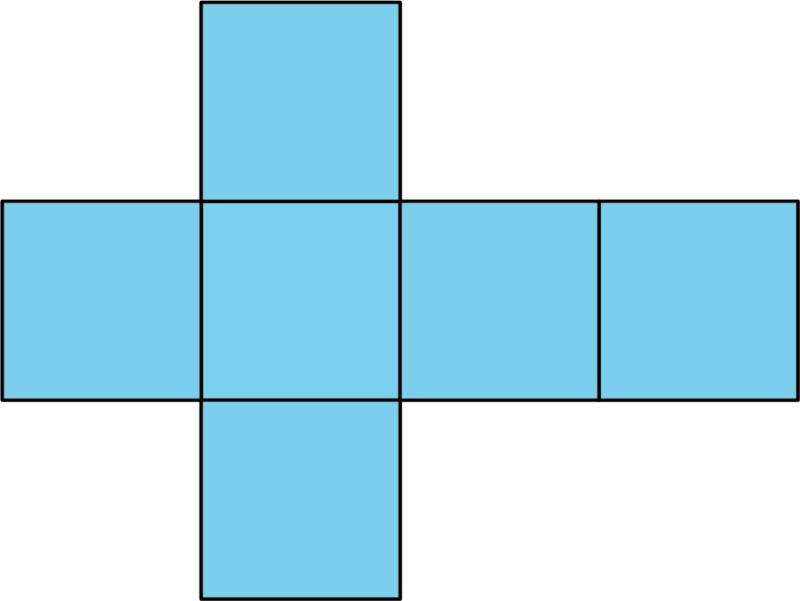 The bases are connected by a set of rectangles (or sometimes parallelograms). A pyramid is a type of polyhedron that has one special face called the base. All of the other faces are triangles that all meet at a single vertex. A net is a two-dimensional representation of a polyhedron. It is composed of polygons that form the faces of a polyhedron. A cube has 6 square faces, so its net is composed of six squares, as shown here. A net can be cut out and folded to make a model of the polyhedron. In a cube, every face shares its edges with 4 other squares. In a net of a cube, not all edges of the squares are joined with another edge. When the net is folded, however, each of these open edges will join another edge. It takes practice to visualize the final polyhedron by just looking at a net. A net is a two-dimensional representation of a polyhedron. It can be cut out and folded to make a model of the polyhedron. Here is a net for a cube. A polyhedron is a three-dimensional figure with faces that are polygonal regions (filled-in polygons). Each face meets one and only one other face along a complete edge. The points where edges meet are called vertices. The plural of polyhedron is polyhedra. A polyhedron always encloses a three-dimensional region. Here are some drawings of polyhedra. A prism is a type of polyhedron with two parallel faces that are identical copies of each other (called bases) connected by rectangles. 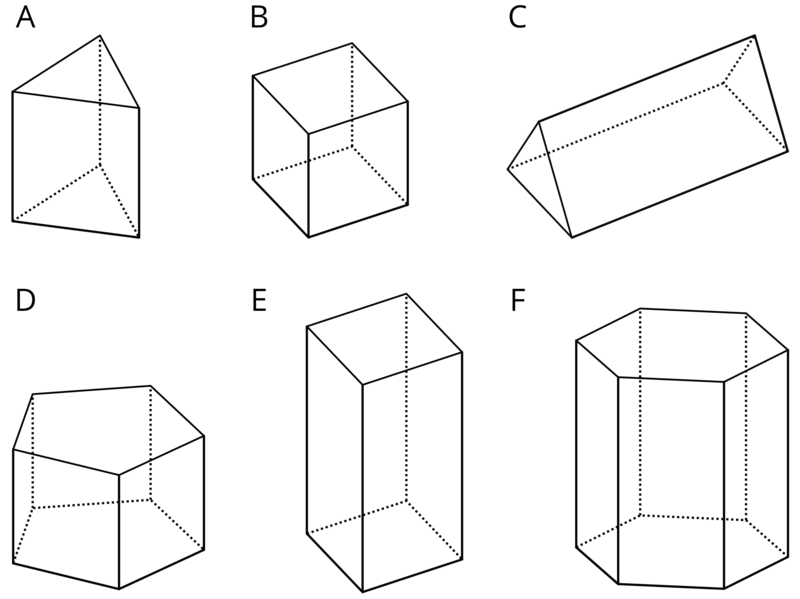 Here are some drawings of some prisms. A vertex is a point where two edges meet in a polygon or a polyhedron. A line segment in a polygon is called an edge (it is also called a side). A line segment where two faces meet in a polyhedron is also called an edge.